Nostalgia is defined as a sentimental longing or wistful affection for the past, typically for a period or place with happy personal associations. The older we get, the more we experience nostalgia. And it is hot summer days that evoke a particularly sweet nostalgia in me. I have relatively few truly good memories of my younger days, growing up in a suburban neighborhood outside Syracuse, New York. But there were days in the summer when I would set myself up in the back yard, under the shade of a birch tree, on an old rattan chaise lounge, with a pile of books, and a cool drink, and just read. That chaise lounge was like a boat in the ocean. It took me to places where I was not. Just me and my books. I was an avid comic book reader early on. Then came the Hardy Boys and Brains Benton mysteries. From there, I graduated to more grown-up reading interests. The chaise had four old, sturdy purple cushions made with a short bristley fabric. It had wheels just like in the picture. But the arms were different in that they had a rattan cup holder and a place to store reading materials. 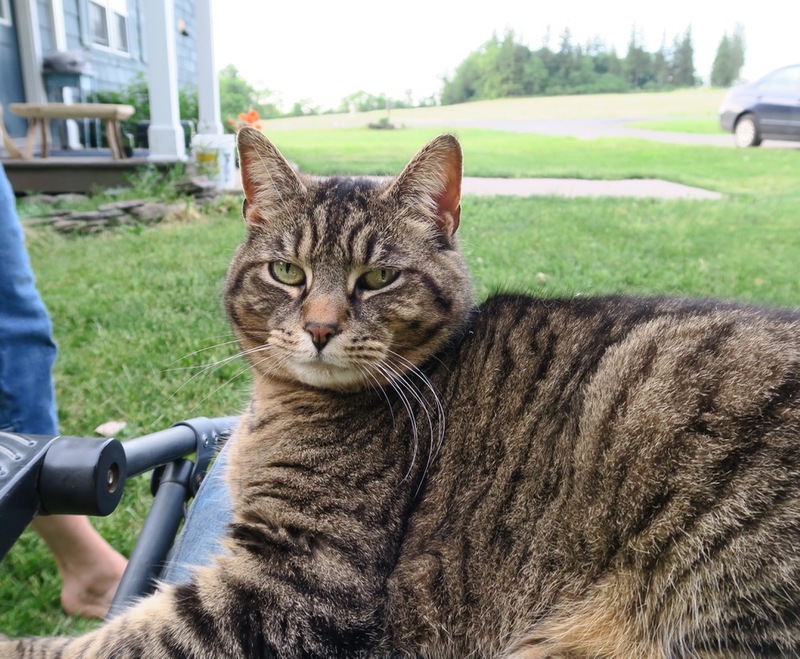 When my family moved out of the suburbs to an old farmhouse in the country (I was in 9th grade), the chaise went upstairs into the barn, where it only occasionally was brought outdoors in the summer. The fact is, in the suburbs, I had pretty much nothing to do in the summer. I mowed the lawn, but that was it for responsibilities. So I would read for hours on end. There were, after all, no computers or video games in those days. And I am thankful for that. 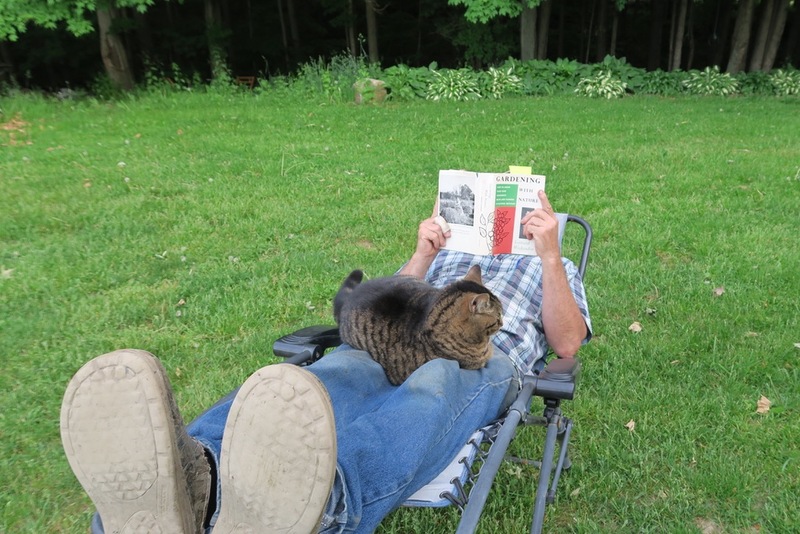 But when we got to the country, there was so much else to be doing that I never read for hours under the shade of a tree in the backyard like I once did. And I've always missed that about summer. The old barn at my parent's place gradually fell into disrepair. The roof leaked in places. I would often go up into the barn and check on the old chaise lounge to make sure it wasn't getting wet. Then in the late 1980's a big wind blew most of the roof off the barn and it partially collapsed. Upon hearing of the damage, I went up to see for myself how bad it was. My main concern was the chaise lounge. Had it survived? Part of the upper floor where it was had collapsed. And portions of the roof had fallen in. The chaise was buried but it was in a pocket of jumbled lumber pieces, completely unharmed. I considered it's preservation from destruction to be something of a miracle at the time. With considerable effort, I got it out of there and brought it home. I made space for the antique in my shop. My thought being that someday I would have the time to spend a whole summer day in my back yard doing nothing but reading books. The nostalgia was powerful. Then, around ten years later, I did something with that chaise lounge that I never expected I would do..... I sold it. I really needed the space in my shop, but, more than that, I needed the money. I couldn't find any pictures or information about the chaise online back then. So I listed it on EBAY with a minimum bid of $100. The single winning bid came from a couple in Maine. They drove all the way to central New York to get the piece, and they were delighted with their purchase. 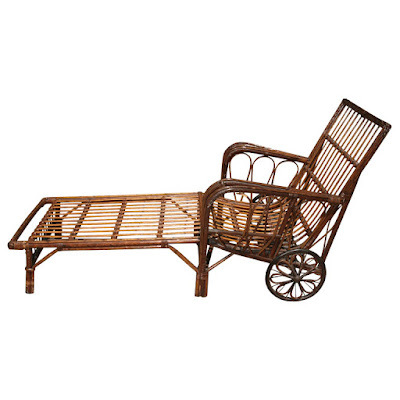 It so happened that they collected and restored antique rattan furniture. They knew the history of the chaise. It was made in Massachusetts in the 1800's (my stepfather's family was from Massachusetts). The man told me it was in remarkably good shape. "They're hard to find in this condition." I smiled and waved good bye as the nice couple drove back to Maine with my chaise lounge. I regretted what I had just done, and I regret it even more to this day. Then I went in my house and checked out the web site the couple had given me. It showed several nice houses on the Maine coast that they rented out in the summers. The pictures of the interior of the houses looked like pictures out of a magazine. They showed beautifully decorated interiors with an abundance of restored antique rattan furniture. Ocean views could be seen through the windows. I needed money at the time. That couple apparently had an abundance of it. And they also had my beloved old chaise lounge. I felt pretty low. It was just a piece of furniture. I can't take it with me when I leave this realm. and it would have no meaning to my children. But still.... the nostalgia. These days, my summers are not for lounging and reading. I typically work at my business, in my garden, on my land, or around my house (I'm still trying to get the roof finished) every day from morning to dark, or until I "hit the wall," as we say around here. My work is not too laborious, and I take small breaks when they're warranted. But I'm persistently slogging away at several projects every day, until my brain or my body are spent. I like to work. I like to be exhausted at the end of a day. I like it when my arms and hands and back and shoulders ache from use. I feel better about myself, and I sleep better. 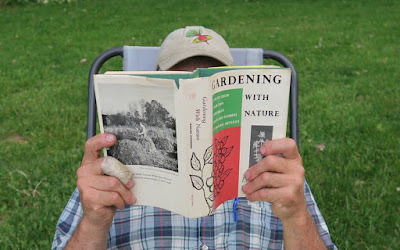 So, yesterday, a Saturday in June, I worked in my garden for awhile, before getting my Planet Whizbang mail-orders packaged. Then I worked for awhile at making Classic American Clothespins. Then I worked for awhile on handles for the Whizbang Wheel Hoe kits I sell. Then I hit the wall. It's far from a vintage rattan chaise lounge, but close enough. And for a little while I was a kid again. I remember those summer days in suburbia too. I read Nancy Drew and Trixie Belden. I also read the Hardy Boys and a lot of Readers Digest Condensed Books. I particularly remember how it felt to sleep well for 8 or 9 hours and wake refreshed and energetic. Youth is wasted on the young, my Grandmother used to say. I think I get what she meant now. Thanks for the memories, yes, diddo, diddo, and diddo all the above comments. But, just like you, Herrick, I, too, said just two days ago, "It's okay for me to be exhausted by my work here on our mountain, in the orchard. I'm glad I'm exhausted. I love this work. I like the benefits. Thank you Lord, for work!" Hi Herrick, You reminded me so much of my reading adventures when I was a Kid! People used to ask my mother Why she let me read all those comic books? She replied, " I don't care WHAT he reads as long as he is reading!" Well she didn't have to worry about all the garbage there is out there now. I read all the series mentioned in the above answers including the Nancy Drew ones who I never let on to my friends that I was reading . Guess I was practicing my mysoginistic (SP) leanings early on, but which I cast aside when I fell in love for the first time. I was also into all the SCI-FI gurus to! As well as Zane Gray and Louis Lemour (sp) etc. My Grandmother had a set of the Encyclopedia Brittanica with updates now and then, and I read every single one of them cover to cover and I am amazed at how well I do nightly watching Jeopardy! A lot of the minutae seems to have stuck in there somewhere! I even learned to eat breakfast left handed because of where my breakfast seat at the counter was . The other one held the all important book/comic book etc. TO THIS DAY i have a pile of unread books on the floor beside my recliner. Still reading at least one a week, usually more, while the TV mumbles on unattuned to my ear!